Evolutyz Corp appoints marketing and branding veteran Raghavendra Hunasgi as Chief Marketing Officer. 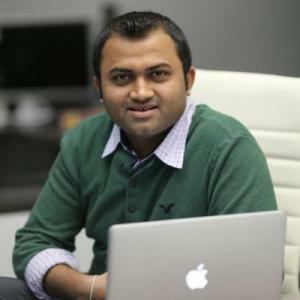 CHICAGO , IL, USA, July 9, 2018 /EINPresswire.com/ -- Chicago based Evolutyz Corp, a leading technology products, solutions, and services company, announced today the appointment of Raghavendra Hunasgi as Chief Marketing Officer and Board Member. Raghavendra is a marketing leader with over 15 years of experience in branding, positioning, and marketing for large IT services and Product companies. His previous roles include Director & Head of Marketing at Cigniti Technologies Inc., where he led the efforts to build World’s largest independent testing services company, Head of Marketing and Branding Products at Google and Worldwide Head Product Marketing, for AssistEdge at Infosys Ltd. He works with UN as South-East Asia advisor, World Economic Forum as Global shaper and member of the board on several start-ups and Martech companies. Raghavendra is a widely recognized branding leader in propelling organizations to a new level across categories and geographies that are leading market transitions. Raghavendra also serves on the advisory board of several universities and B-schools globally. He is the author of two books and holds a Ph.D. in Social Media Marketing and a Management Degree in Marketing from Harvard Business School. As CMO at Evolutyz Corp, Raghavendra will orchestrate the company vision, strategy, and growth. Evolutyz Corp recently launched its flagship product IdSec, a part of Enterprise Security Suite that automates enterprise application access and authorization needs. The advanced intuitive self-service request system of IdSec empowers customers to easily provision users across multiple systems. Evolutyz Corp’s application performance monitoring product, TestLuas continues to win accolades for pioneering real-time insights. The real-time DevOps view of TestLuas empowers customers to build an effective continuous delivery strategy. Evolutyz Corp is a leading next-generation IT products, platforms, and services company delivering guaranteed business outcomes, seamless customer experience, actionable insights and IP-led digital transformation. Evolutyz Corp brings unparalleled knowledge of domains, markets, and technology platforms, to enable clients realize their business goals. For more information, visit evolutyz.com.